Located on Baker Street in Marylebone, Park View Residence is found in one of London's most desirable and upmarket areas. Whilst residents enjoy close proximity to two of London's most beautiful parks, Hyde Park to the south and Regent's Park directly to the east, the site also has historical significance; Sherlock Holmes the most famous fictional detective of the nineteenth century lived at this address. 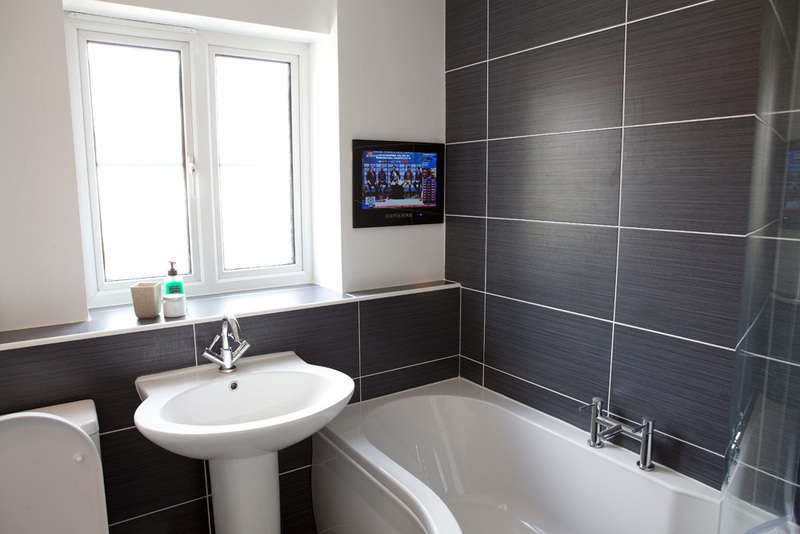 During a recent refurbishment, Bathroom TV store were selected to supply, fit and install 76 of our 19'' Black Watervue TVs above the bath by manager Sally Randall. All of the TVs are 100% waterproof wih mist-free technology and an IP rating 65, one of the safest ratings in the industry. This ensures safe viewing and a pin-sharp picture, even in humid bathroom or wet room conditions. For many customers, a bathroom TV changes the way they use their bathroom – it becomes somewhere they can relax and enjoy some quality time. So when David came to us, we knew exactly what would meet his requirements. Our client specifically wanted a sleek 19" Mirrored TV with Sky functionality to fit a small space and our 19" model meets his requirements. 'We looked all over the Internet and felt Watervue were priced the most competitively. What I love most about the product is when it is switched off it is a Mirror which makes it very discrete. It looks fantastic in our bathroom; as a mirror and as a television. We were looking for an affordable bathroom TV and this product was in a league of its own for quality and price. I found the whole process incredibly stress free and simple as bathroomtv.co.uk website, customer care and expert advice were all extremely helpful. I have already recommended my close friend to get one”.